Are you looking for a career change? Perhaps, you are interested in lending your expertise to a company by working as an independent contractor or consultant. You wouldn’t be alone. A good percentage of the U.S. population is self-employed, meaning that they are working as independent contractors, consultants, entrepreneurs, and freelancers. The question then becomes: where do you begin? 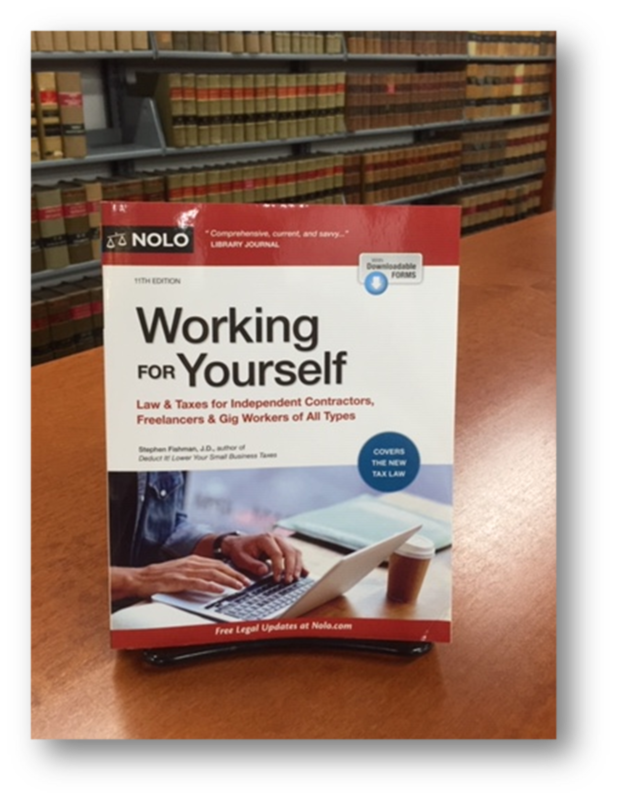 A good starting place is Nolo’s Working for Yourself: Law & Taxes for Independent Contractors, Freelancers & Gig Workers of All Types, the newest book to join the Law Library’s Self-Help Collection. You can also find updates and changes made to the Tax Cuts and Jobs Act that are beneficial to those who are self-employed. In other words, Working for Yourself has the pertinent information you need to get yourself started on the road to self-employment. Other books by Nolo in the Law Library’s collection that you might find to be of interest include: Legal Forms for Starting and Running a Small Business and the Small Business Start-Up Kit. As a companion to this treatise, the Harris County Law Library also has in its collection, Advising Small Businesses: Forms. This indispensable set provides attorneys with practical tools in the shape of “ready-to-use” forms and checklists, which include sample letters, operating agreements, employment policies, and closing documents. If you an attorney who owns, operates, manages, or advises small businesses, we hope you’ll find this resource helpful. For additional resources that you can find here at the Law Library and online, visit our Events page. December is Small Business Resource Month at the Harris County Law Library. All month long, we're featuring resources, tailored for solo and small firm attorneys, who own, operate, manage, or advise small businesses. Finding the best law practice management software to meet the needs of your small firm can be a challenge. There are many different options to choose from at a range of prices and levels of sophistication. The Legal Tech Institute at Harris County Law Library provides links to several law practice management software packages, along with a link to the American Bar Association Legal Technology Buyer's Guide. While we do not endorse any particular product or service, we do list a limited number of affordable options. Features offered by the various programs are similar. In general, they offer functionality for client communications, billing and accounting, task management, document automation, time tracking, and calendaring. Comparing how the programs differ is key. The following are good questions to ask when deciding which law practice management software is best for you? Is it a cloud based system? How much data storage is provided? Is access secure for you and your clients? Is there a mobile version for access on the go? How good is it? Does it provide access to all features or is it limited? Does it integrate with any third-party programs such as Box, Dropbox, Fastcase, Google Drive, Office 365 or Quickbooks? After exploring your options, contact the chosen providers to request a free trial and/or a guided demonstration. Then, let the software work for you. Using a law practice management program to automate routine tasks will boost your business, giving you more time to focus on serving your clients' needs. Additional resources for small businesses can be found online at the links below. University of Houston Small Business Development Center website, where you can download a free copy of the Guide to Starting a Business in Texas.